Whether you’re looking for porcelain tile, aluminum, or our proprietary TerraFab technology, Veranda Classics has the fire pit to suit your needs. Veranda Classics fire pits are available in a variety of sizes and styles to fit a host of outdoor spaces. Each fire pit is equipped with an electronic ignition, porcelain coated stainless steel fire bowl, and 50,000 BTU burner. Standard propane hookup, natural gas orifice, lava rocks, and fabric weather cover is included with every fire pit. All Veranda Classics fire pits meet CSA (Canadian Standard) certification. The Fire Pits Romance II Sq. Gas Fire Pit w/ TerraFab Base & Wood Look Top w/ Lava Rock & Weather Cover by Veranda Classics by Foremost from Boulevard Home Furnishings. We proudly serve the St. George, Cedar City, Hurricane, Utah, Mesquite, Nevada area. Product availability may vary. Contact us for the most current availability on this product. 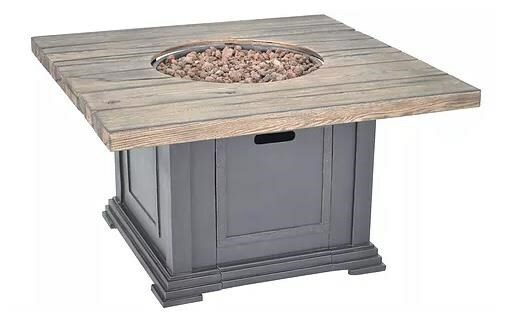 The Fire Pits collection is a great option if you are looking for Outdoor Furniture in the St. George, Cedar City, Hurricane, Utah, Mesquite, Nevada area.